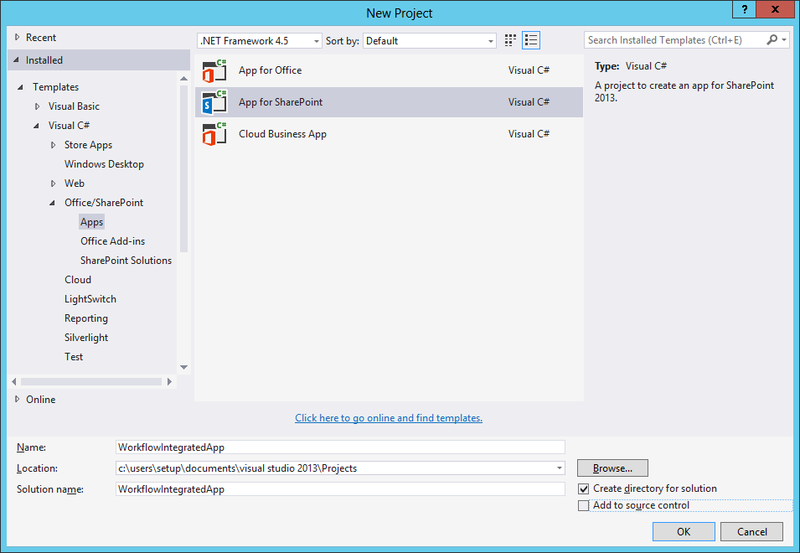 4) Go to the Project Properties and set the "Integrated App" property to True. That's it! Luckily, Tim McConnell who is the speaker in the video was part of the YamJam and he answered that Integrated Workflow Apps are already available on SharePoint Online but they are waiting for tooling support so no official announcement has been made till now. I have tested them on my development Office 365 Tenant and it works! In this post, I will be detailing the process by which you can get it working too. 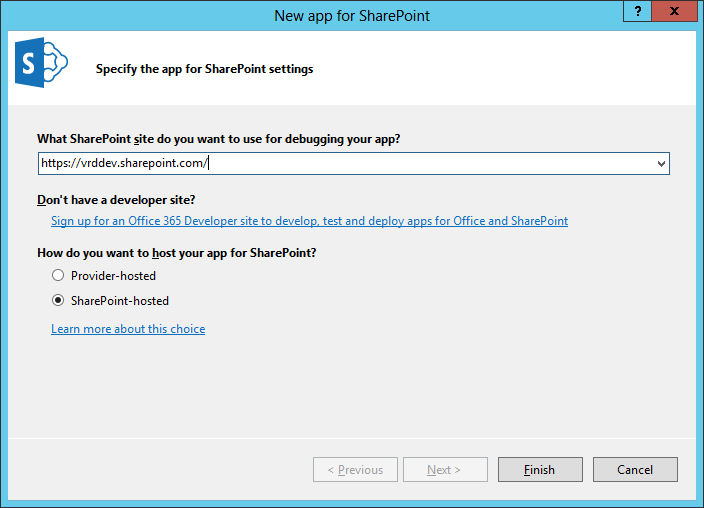 2) Enter the SharePoint Online Site Url and select the hosting model for your app. I have selected SharePoint Hosted. 6) Select "Create New" for History List and Task List. 7) Add some sample activities to your Workflow. 9) Right click App Project > Publish > Package the app. 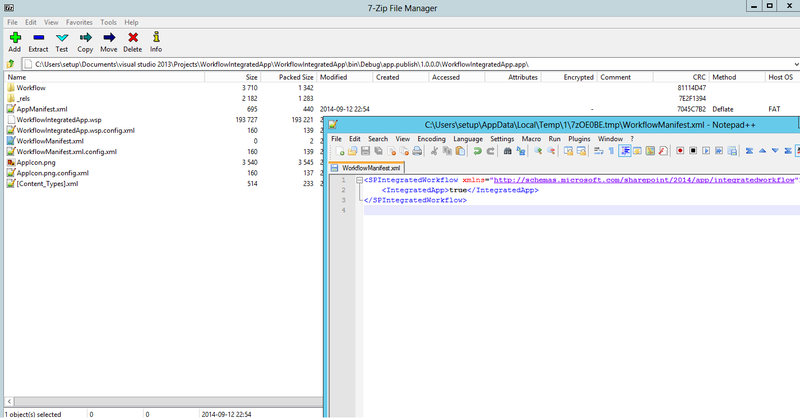 A window will pop up showing you the packaged .app file. 10) Now the interesting part. 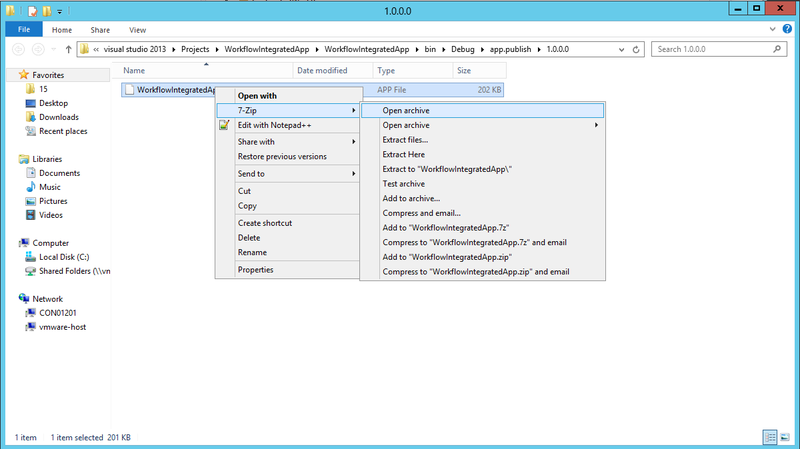 Open the .app file as an archive with a tool of your choice. 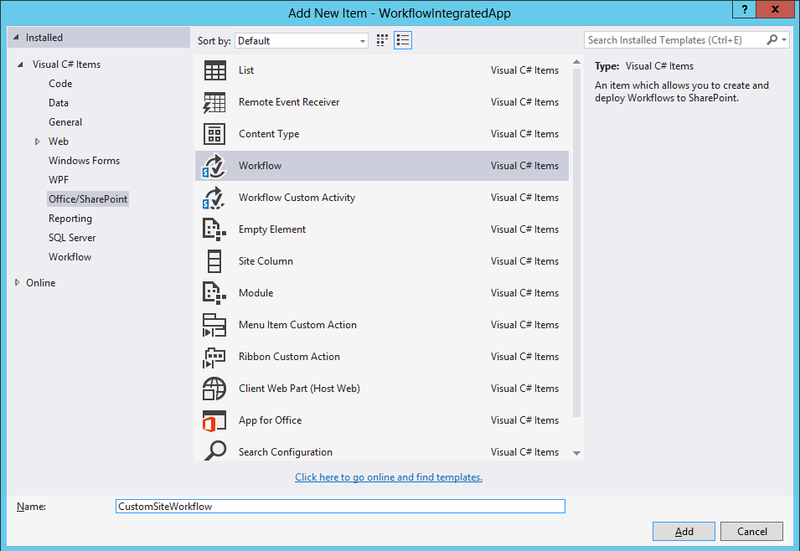 11) Once opened, look for the WorkflowManifest.xml file and open it. It will be empty to start with. Copy the following in the file and save it. 12) After Clicking save, you will get the following prompt. Click Ok.
13) Now your .app package is ready to be deployed to your App Catalog. 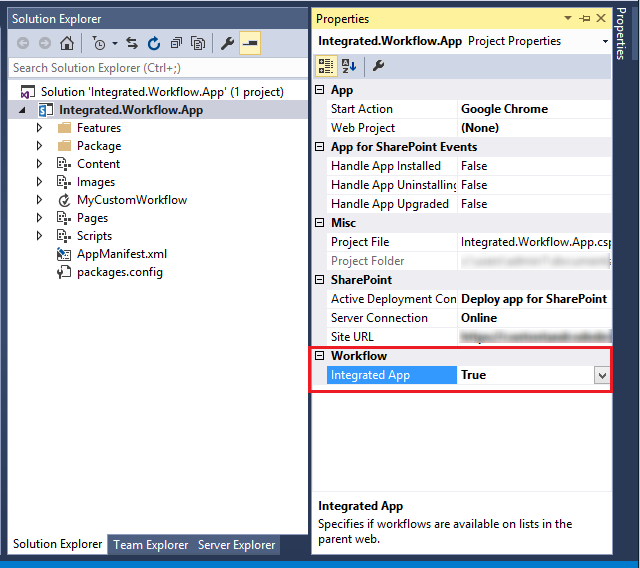 Go to your App Catalog and upload the .app file in the "Apps for SharePoint" document library. 14) Once uploaded, go to your Team Site > Site Contents > Add an App > Select your app and add it to your Team Site. 15) You will be prompted to trust your App. Click on "Trust It". 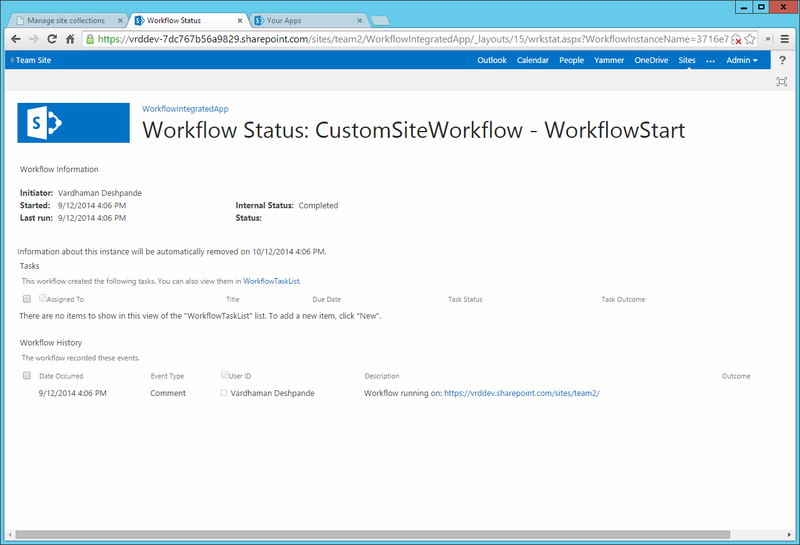 17) Click on your App to see your Site Workflow deployed on the site. Click on the Workflow to start it. 19) You can see that the Workflow logged the url of the Team Site on which it was running. 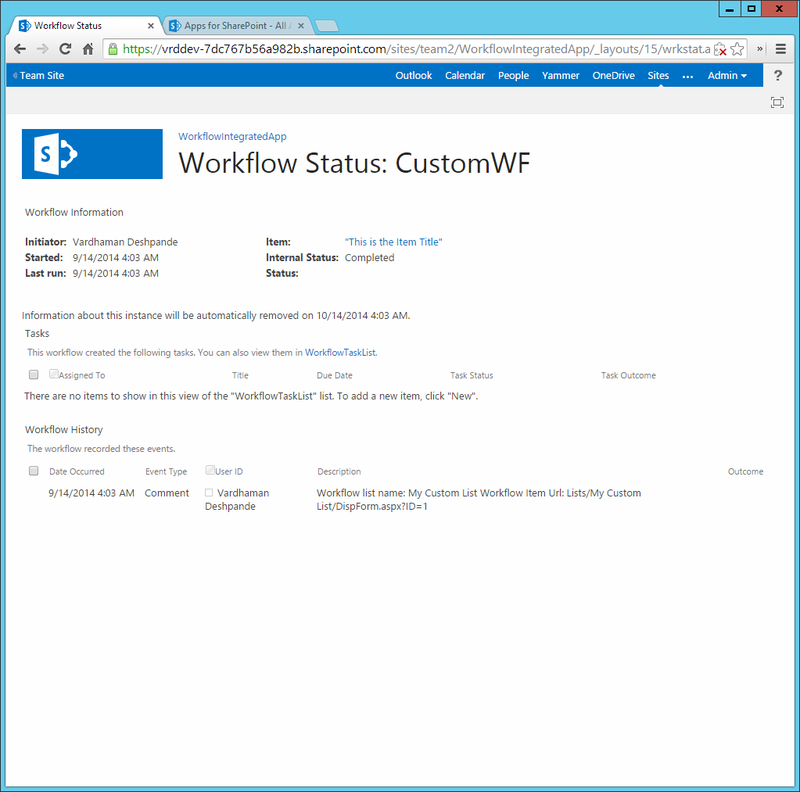 This proves that the Workflow was deployed to and ran on the Host Web (Content Site). 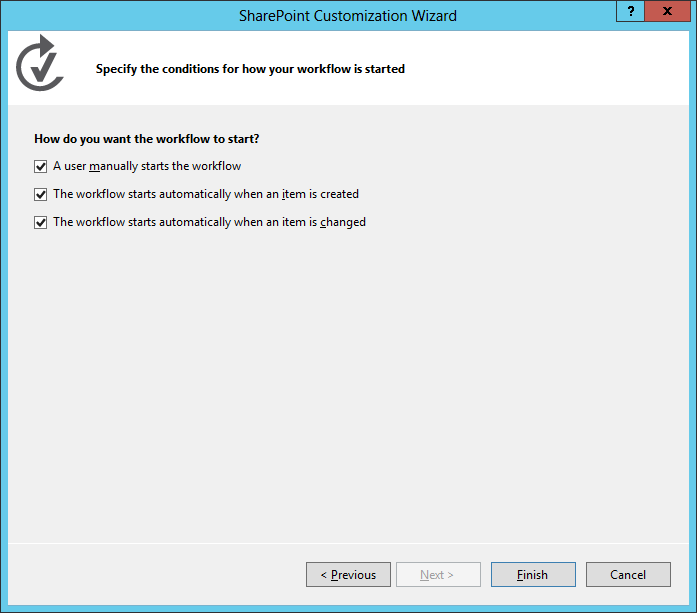 The process to deploy the list workflow is quite the same except in step 5, select List Workflow. Do not associate your workflow to any List. We will do the association after the deployment of the Workflow. Select when you want your workflow to start. 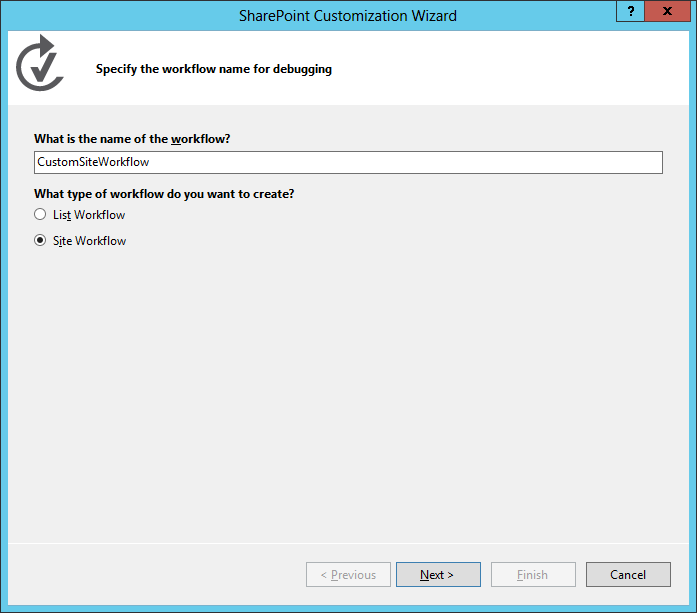 Click on your App, Associate your Custom Workflow by giving it a name and configuring other settings. Click on OK.
After you associate the Workflow, Start it either manually, or create an item, or update an item depending on the method you selected in the Workflow Designer in the App. 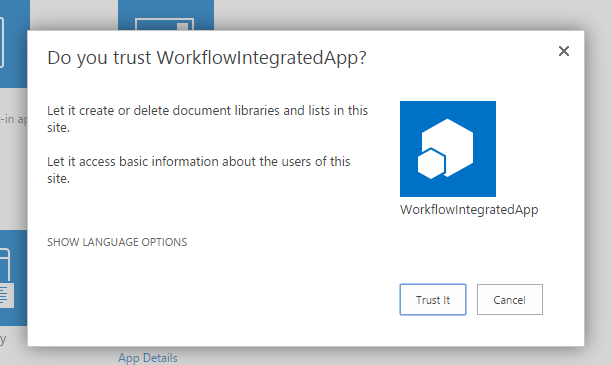 I followed the steps you mentioned, but I don't see my app on the add a workflow page for a list. I'm using VS 2012, is that a problem? Sorry I haven't tested the process in VS 2012. Maybe you can try to see where your project differs from mine. My project is on github and I have posted the link int he article. 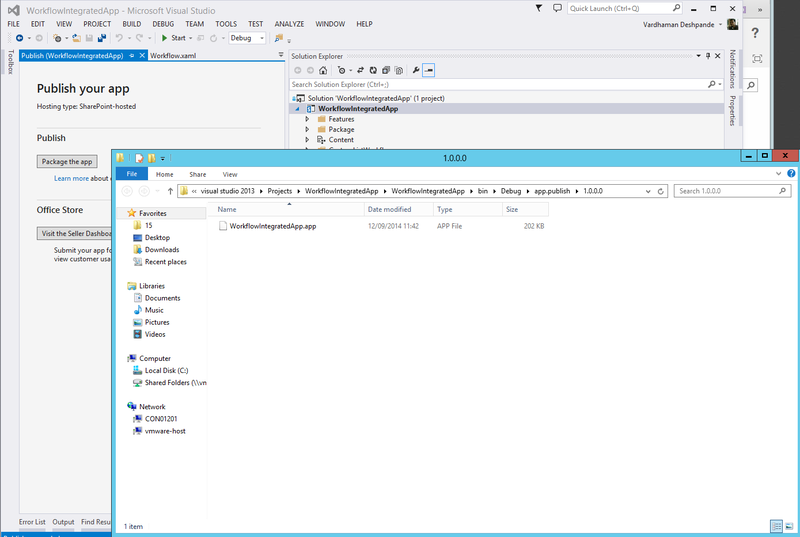 Are you testing against SharePoint Online or a SharePoint 2013 server? 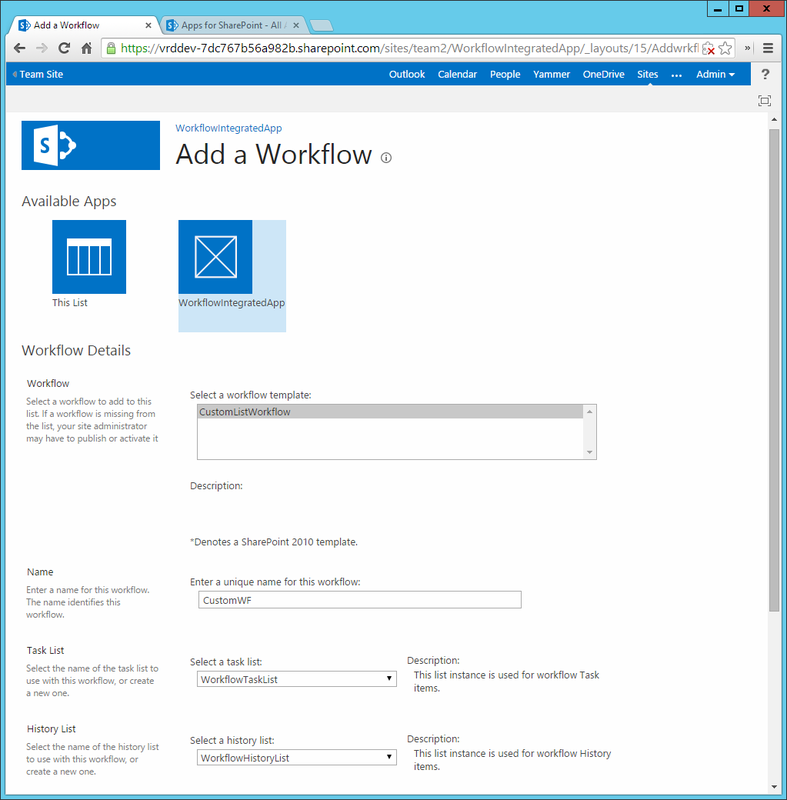 As Vardhaman mentioned, integrated workflows are not available in the server product. I have followed same steps i was getting the following error. The server at apps-b99ebeeafe35a7.solutionapps.com.dns can't be found, because the DNS lookup failed. DNS is the network service that translates a website's name to its Internet address. This error is most often caused by having no connection to the Internet or a misconfigured network. It can also be caused by an unresponsive DNS server or a firewall preventing Google Chrome from accessing the network. Please help me to resolve it as soon as possible. Very Urgent for me. I need to work for On-Premise. Is there a way to get it working. Please guide me. Can u please explain me why it works only for SPOnline. As Tim McConnell (from the SharePoint product group) said above, they have not yet made this functionality available in On-Premises SharePoint Server Product. It might be there as part of future versions or service packs. Awaiting approval. We'll let you know about any updates." Do you have any idea ?? Most likely it is a permissions issue. I did face the same error but giving the App Manage permissions on the Host Web fixed it for me. You can try giving different permissions in the App Manifest. Hi... Thanks for all your help... but so far I have not been able to get the status working with different permissions... I suspect that this issue is related to my other problem... I can't get the list workflow to start on item created or updated... It Works when I start it manually… I have also noted that I don’t get the option to select “manually”, “Item created” or “Item changed” as showed on image 18 in your tutorial. I’m not sure if this has to do with my VS version or that I’m trying this on at Sharepoint site that’s not a developer site…..
Have you installed all the updates to Visual Studio 2013? 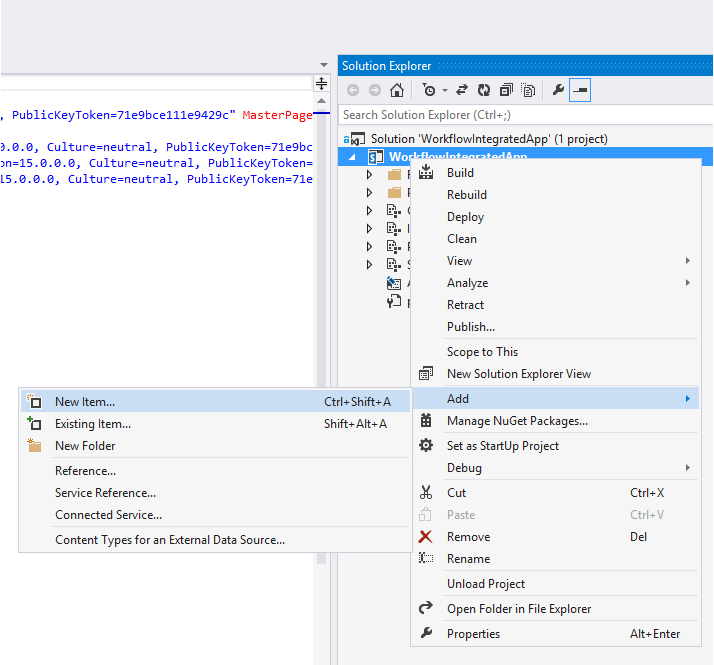 And do you also have the latest version of Microsoft Office Developer Tools for Visual Studio 2013? Hi Vardhaman, I followed your steps and I was able to deploy the app and the workflow seems to be working. I am using VS 2012 with O365 tools. After following ur steps I am trying to execute a workflow which will be associated to Discussion list on HostSite. I deployed it on app store, but when I add the app it says "Sorry, something went wrong with adding the app." I am not sure what I am doing wrong. Can you please guide me in this scenario? Hi Vardhaman, I followed your steps and I was able to deploy the app and the workflow seems to be working fine. 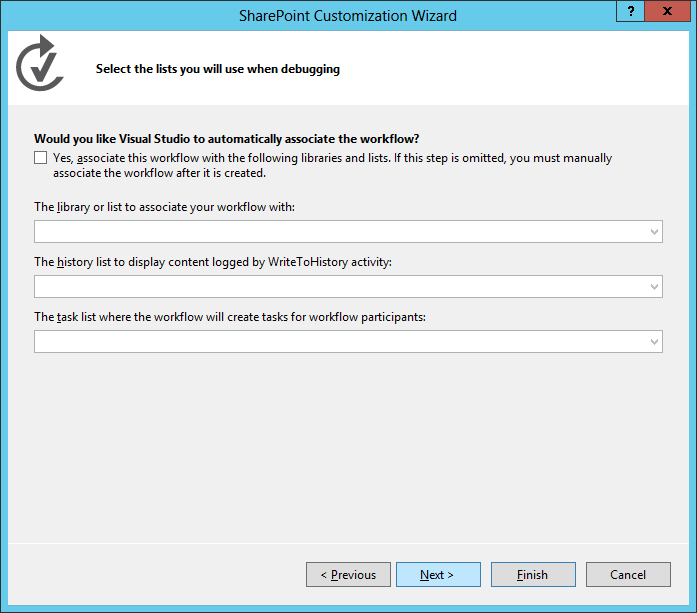 I am using VS 2012 with O365 tools. 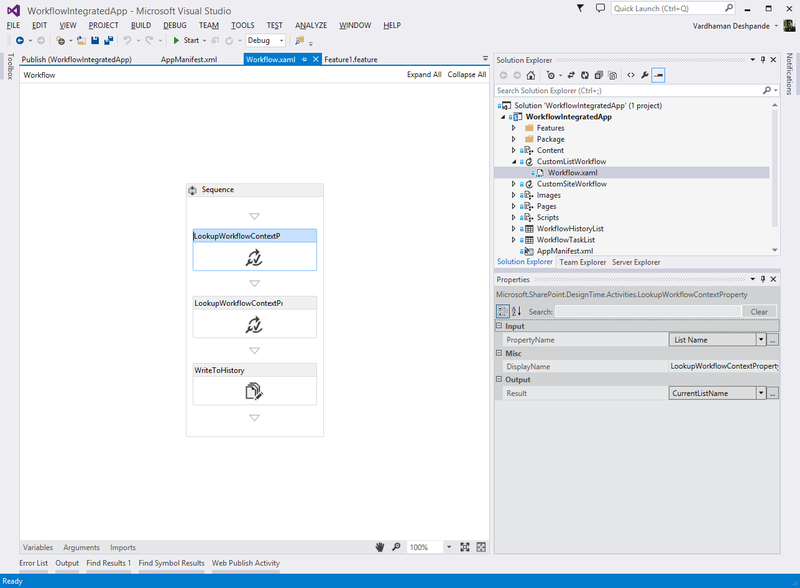 Can you re-create this problem by creating a new test app in VS? Hi Vardhaman, Iam facing above problem with a new app project only. 1. You mentioned not to use this trick in production and there will be tools deployed sooner. My I know what another approach I can use to connect to my HostSite Custom list through app workflow. Please note I use O365. 2. In my above comment regarding workflow for discussion list(Host site), I would also like to understanding if I have messed up with some steps in the workflow, may b due to which it is failing. 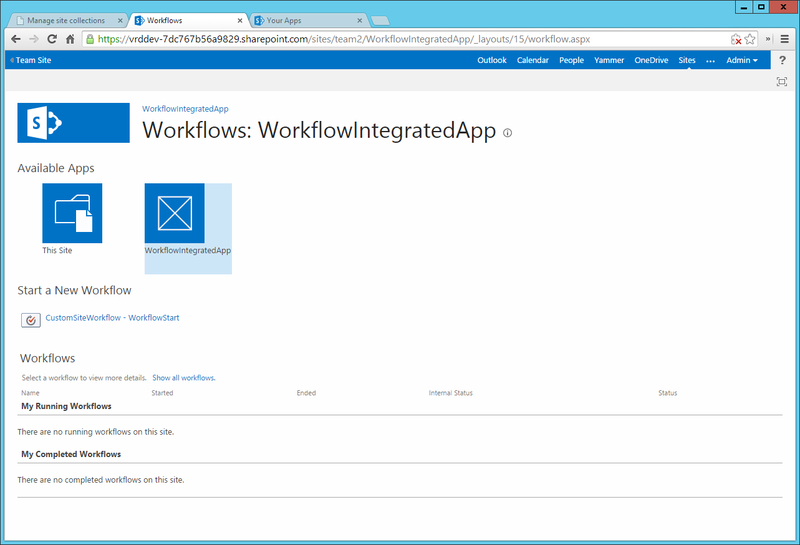 Any news if integrated workflow apps are now officially announced for Office365. I have a need where I want to deploy workflow via apps. Thanks. This feature is official in SPO and available to use, yes. 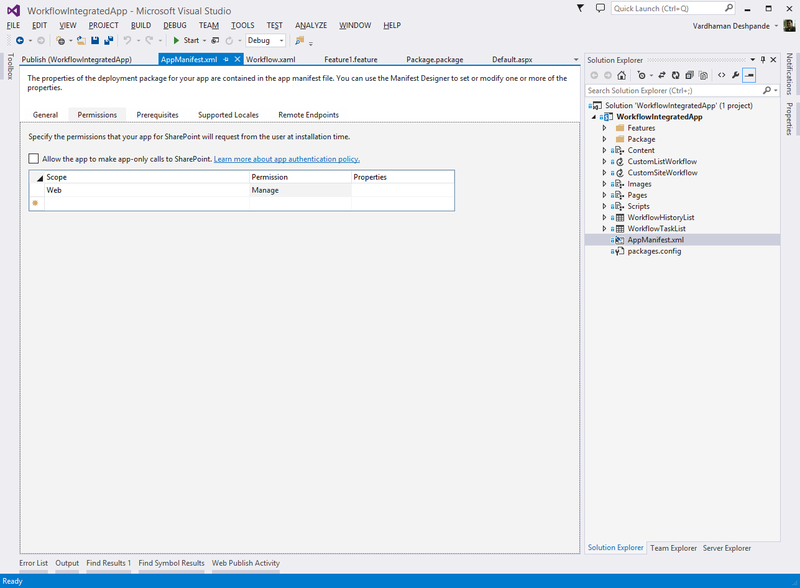 Visual Studio also modified their latest tools so you no longer need to modify the app package after it's been built. Please move to the latest VS release (2015) to try it out! 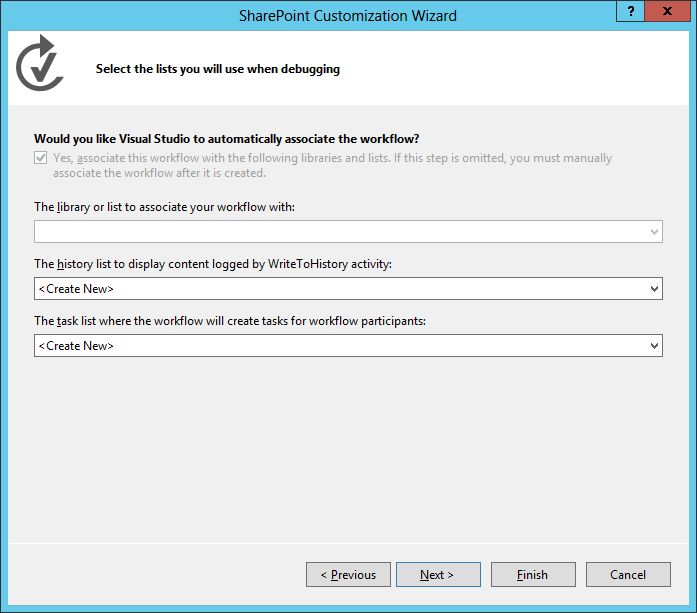 I have updated the post with the steps to "officially" create an Integrated Workflow App (Add-In) in Visual Studio 2015. I have deplyoed my app in app catalog and added this app from app stapling to particular site collection but my integrated app workflow is not listed in the particular list.Please help me out on this issue? 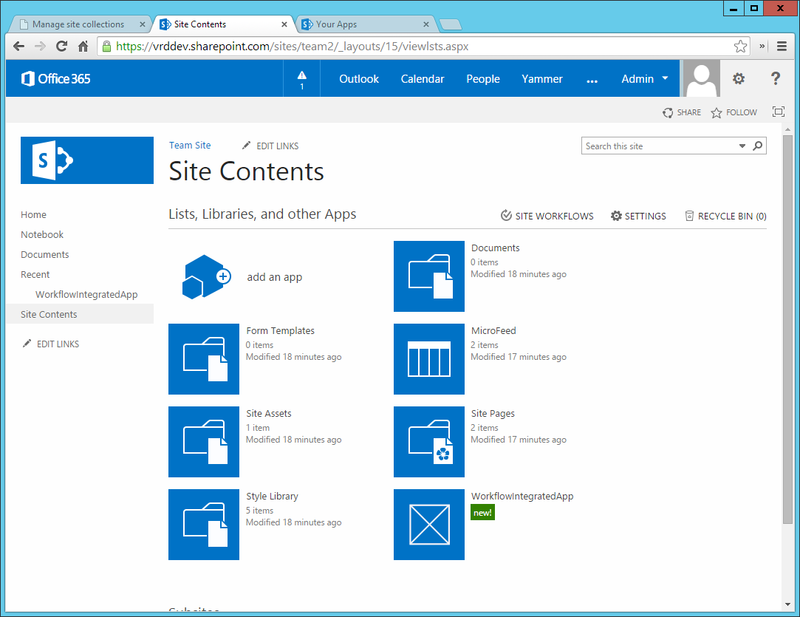 Once i add the app to SharePoint online app catalog it shows "Valid App Package" value No. Due to this app is not available to add in site collection. Any idea? Hi, and thank you for this great article. I have a particular need and maybe you can help me. In my workflow deployed, i'm trying to create an item in a list also deployed by the add-in (so IN the app web). Unfortunately, i got an error on the createlistitem activity when my workflow fires : "List does not exist3. It seems that the workflow tries to find the list in the host web, not in the app. It is obvious that it tries to find my list in the host web, and not in the app web. Do you know any way to achieve this ? Integrated workflow add-ins are configured at the add-in level, so you cannot mix and match one portion of a workflow to address the add-in site and another to address the parent site. All workflow calls will focus on the parent site. Thank you Tim for your reply. So I'll try to create my list first (in my host web), and the deploy my workflow. 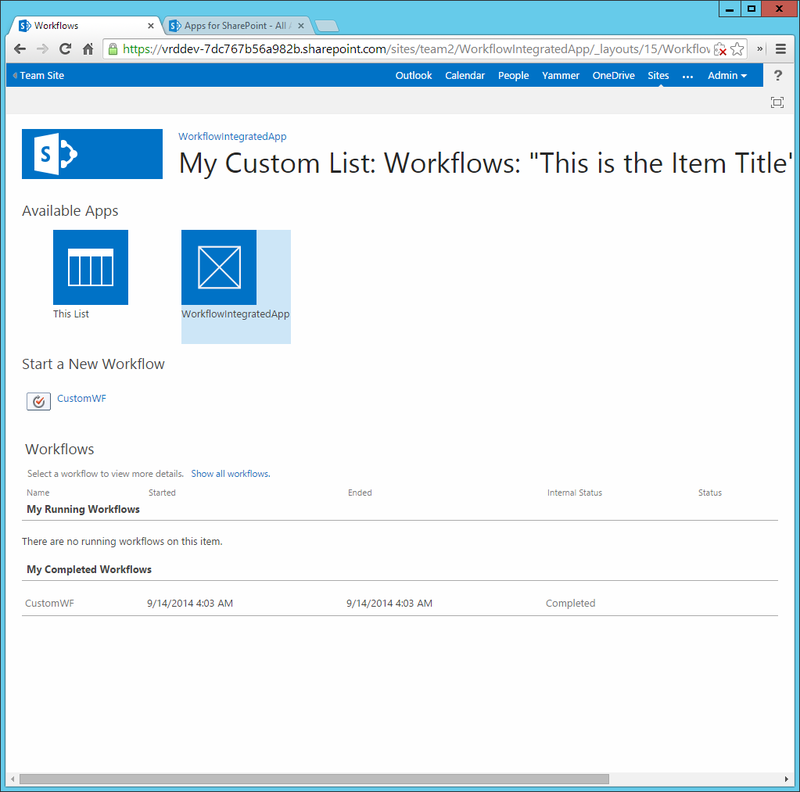 Do you know if there's a way to get a host web list guid from an integrated workflow activity? I found this link, i'm now able to retrieve my list id from the Title with Rest, and so to create an item in my host web list. 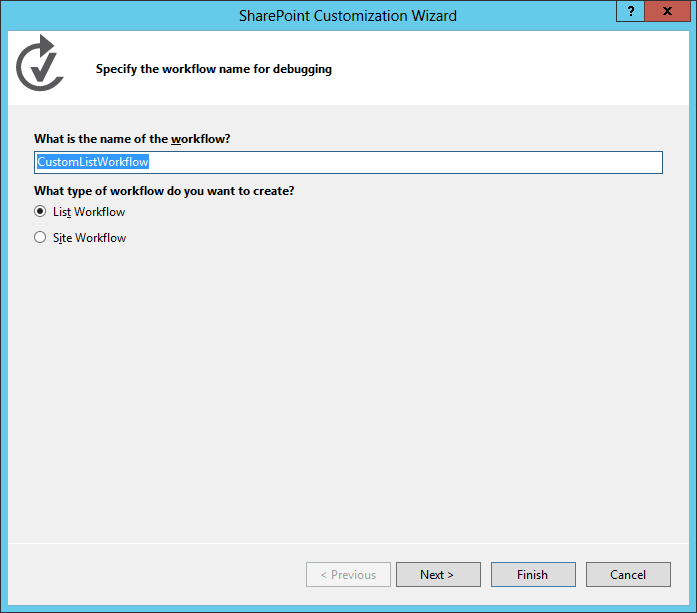 Hi Vardhaman, Will SharePoint Online Integrated Workflow Apps works on office 365 dedicated? 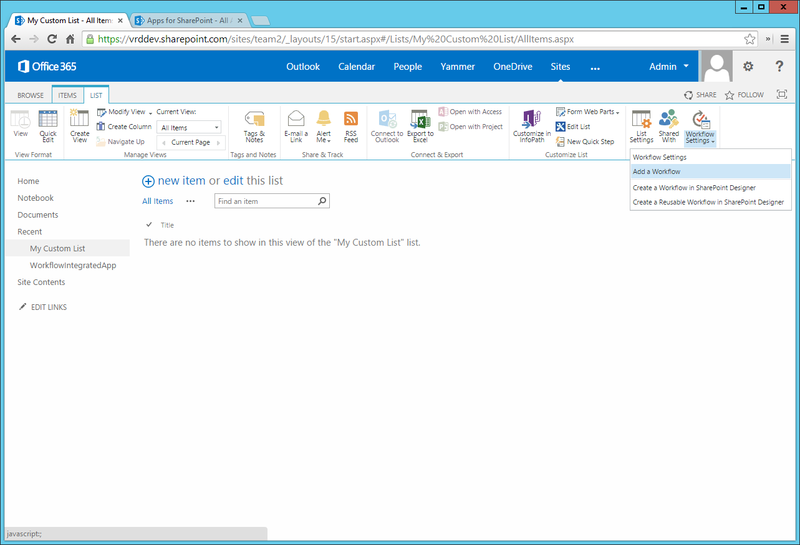 The good news is that in SharePoint 2016 RC for On Premises it works as well. So this functionality is coming to On Premises as well. 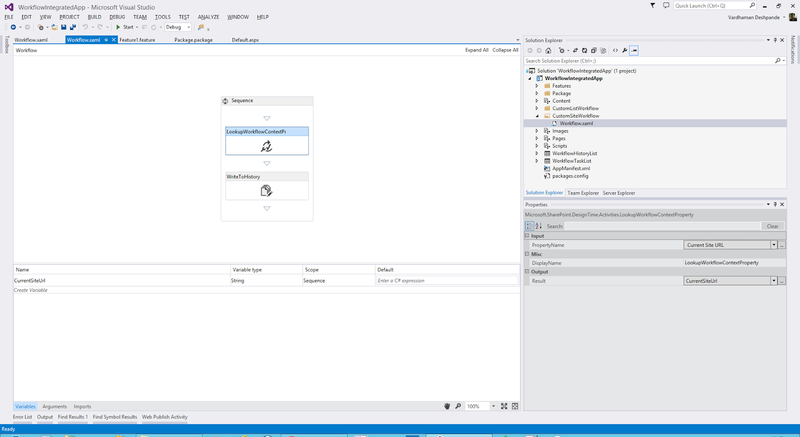 For Visual Studio 2013 with the at present latest update you still have to hack it into the Add-In package, for Visual Studio 2015 you have the handy switch in the properties as mentioned above. I'm also having the same issue as the above poster "Martin Sørensen". I can't get the list workflow to start on item created or updated. 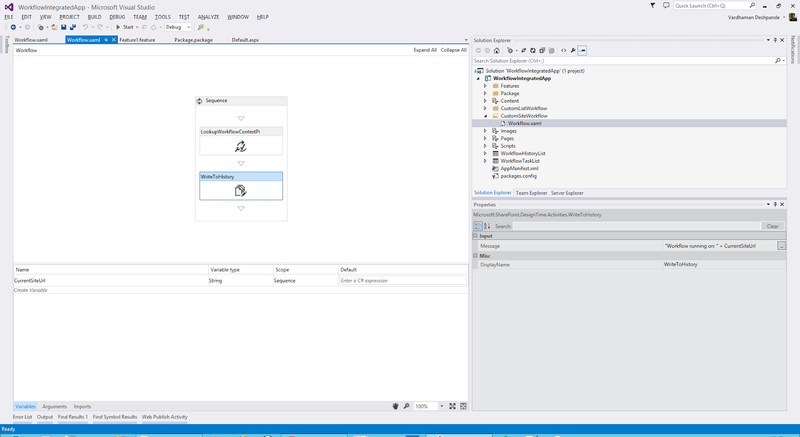 It Works when I start it manually, I have also noted that I don’t get the option to select “manually”, “Item created” or “Item changed” in VS as shown on image 18 in your tutorial. I'm using VS 2015 with Office dev tools installed. Thanks Vardhaman for such a wonderful article. It helped me a lot to start me understanding the SP WF integrated apps. Hi, after deployment if any change in workflow how to update? 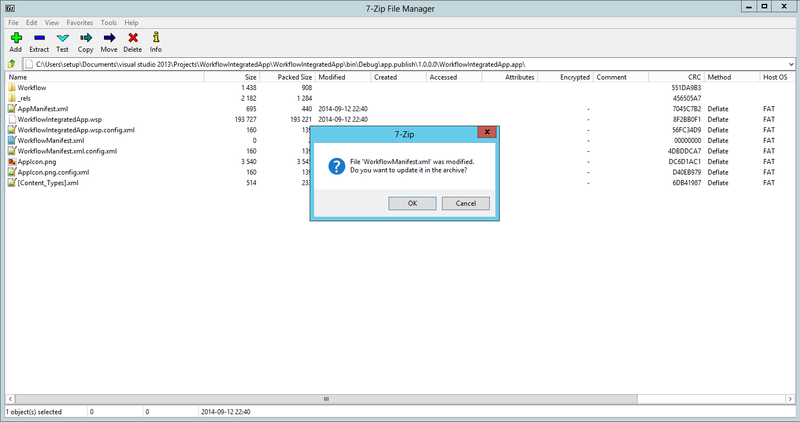 You need to do a full app upgrade to change the workflows.